Coming 31st August 2008 is Malaysia’s 51st Independence Day. Although I will not be in Malaysia at that time, I hope that Malaysia be peaceful and the citizens will be able to live together in harmony. Sometimes, I feel special being a Malaysian because it is a multiracial country, though the current political issues have tarnished Malaysia’s image. All Malaysian should stand and work together towards the future. Finally, I still hope that Malaysia really BOLEH! Add your site(s) to the list if you’re a proud Malaysian Blogger! Pass this tag to as many Malaysian Blogger as you know, or if you’re interested but nobody tags you, just include yourself voluntarily. Show some patriotism! Once you’ve done posting this tag, leave a comment HERE! and you will be visited by a Malaysian local fruit, Mangosteen by the name of Mango! and added to the Master List. Update list regularly to ensure every Malaysian Blogger gets equal link benefit. 1. mangosteenskin – Saya anak Malaysia! 2. Life is too short to be ordinary – Malaysia Tanahair Ku! 3. Sha’s Love & Passion – Aku Anak Merdeka 4. A room of crazy scrapper – Merdeka!Merdeka! Merdeka? 5. Fliffy – Aku Patriotik, Sayang Malaysia ! 6. Rizal 7. haniz – Merdeka Forever! 8. Prozak Nation 9. CarolPinky – Proud Malaysian! 10. Mariuca – I heart Malaysia! 11. Emila’s Illustrated Blog – Saya Anak Malaysia juga 12. Simple Life – Sam – Saya Anak Malaysia 13. Shemah’s My Sweet Escape – Live, Enjoy and Love.. MALAYSIA! 14. Mariuca’s Perfume Gallery – Made in Malaysia! 15. 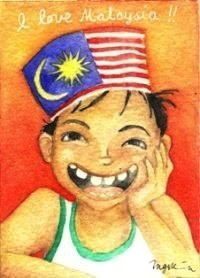 Yani-Tennitodoku-Proud to be a Malaysian-MERDEKA! 16.Bluecrystaldude from My Little Black Pot – Saya Harap Malaysia Terus Maju! 17. Apples of the eyes 18. Snapshotcap – Freedom of choice is made for you my friend 🙂 19. Anaheus 20.Confessions Of A Breathing Tote Bag 21. A Great Pleasure – Malaysia is a food paradise ~ simply yummy~licious! 22. Mummy HnH – Harith and Hannah – MERDEKA 51st Celebration!!! 23. Shafie – I’m Here For U Malaysia 24. Nessa – Happy 51st Merdeka, Malaysia! 25. marvic 26. Deasya 27. Asian Mutt International 28. Point Blank – Sokonglah Pelancongan Domestik, Malaysia Cantik Indah Nian! 29. My Ideas 4 You – Proud Malaysian 30. you’re next!